The other kind of Chestnut is commonly called Horse Chestnut. It is not related to this tree. 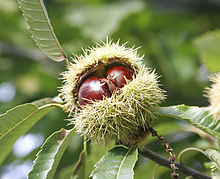 Sweet Chestnut, sometimes called European Chestnut, Spanish Chestnut or Portuguese Chestnut is a family of trees. Originally these trees were native to the Mediterranean parts of Europe and Asia Minor. These trees can grow to sizes between 20 and 35m high. The trees are deciduous, they do not have leaves in winter. The trees are usually grown for their edible fruit. This page was last changed on 9 March 2015, at 06:37.